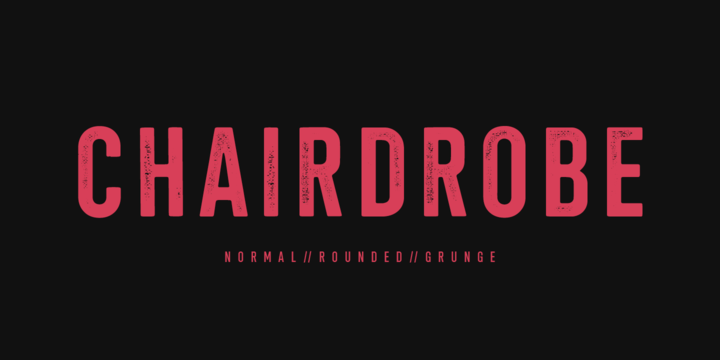 Chairdrobe is a sans serif typeface created by Christoph Zeugswetter and published by WRKSTT Graphicstudio which has an urban vibe and in comparison to a bunch of famous freeware tontfaces with similar style. It has lower case letters and a big variety in styles and weights. It comes in 3 variations (Normal, Rounded, Grunge) each ith 7 weights (from Thin to Black) and italics. It features Upper & Lowercase glypsh, the x-heights is pretty high to create the same consistent lines as yiu get when writting just in Uppercases. Enjoy! Price: starting from $25 for one font to $580 for all 32 fonts. A font description published on Wednesday, May 9th, 2018 in Christoph Zeugswetter, Fonts, WRKSTT Graphicstudio by Alexandra that has 1,160 views.